Wow! Once again, you have created another inspiring photo. Unlike many photographers out there, you have a variety of different genres and styles you photograph, the perfect "Jack of All Trades". I love the texture you managed to capture of the bunny's fur. Everything about the bunny seems soft and cute, and using the shirt as a "background" helps the bunny stand out again. But, I feel the most attracting part of the photo is the fluffy, cute-ish feeling in invokes inside of you. The technique you used to achieve this feeling is superb, but sometimes it isn't the actual picture that is the most vital, rather it is the psychological effect it has on one's mind. My first impression was, "awwww" I'm a bunny lover. mine and my Finance's mascot is a bunny . 26 out of 31 deviants thought this was fair. i seriously pulled this face! That's so adorable! Looks like such a gentle little bunny. I love this Is that you holding Cinnamon? wow, I am surprized by how clearly you are able to get animal shots - photographing moving things is always hard, even if they are being held! Comfort is when somebunny loves you! Aww! Look at the cute bun! I just wanna boop its nose! *Er-hm* Sorry, great picture. Love the soft lighting. Awwwwwww! He looks so cute with his ears back! 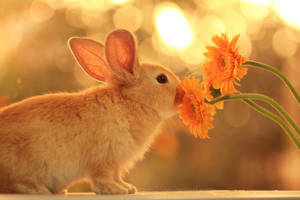 Judging by your photos your life is just full of beautiful flowers and cute bunnies! o.o ... 0.o ... He's so cute...Bunnies are irresistable to me. I just want to pet their adorable little feet and ears. This is so adorable, great shot. I love all animals but for some reason bunnies seem to really catch my eye. I love this! Hmmm another rat. Nasty! Call pest control. 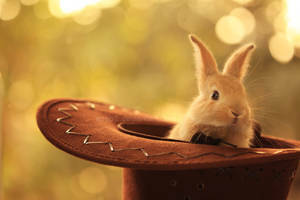 What kind of rabbit, if you don't mind me asking? just a typical domestic rabbit. i own six of those, y'see. and one of 'em looks exactly like that cute bunny on that picture. T'is probably four weeks old according to my observation. Rabbits like this'll probably grow for at least twelve to fifteen inches long for its adult age. Im sorry but.. I must steal your bunny!! shes way to cute to resist!! !